Your buildings reflect your company and your business ethos. The exterior of your property is the first view that visitors and staff have and creates that all important first impression. Dirty or stained exterior, mould or moss patches, grass sprouting from gutters, dirty windows and doors can all create the wrong impression. We clean every type of external building material using only the best equipment and techniques. 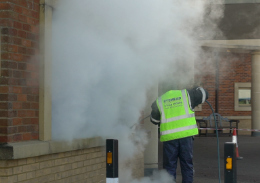 Our tried and trusted methods include pressure washing, hand scrubbing and hot steam cleaning including the industry leading DOFF 150°C steam based, stone cleaning system, guaranteed to breathe new life into any building. 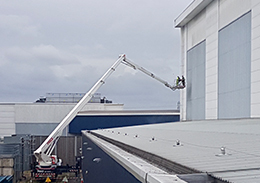 We clean to all heights using the best hydraulic equipment available, enabling us to reach every inch of your building. We remove all stains including general dirt, moss, mildew, wildlife stains and any other debris that has managed to implant itself on the fabric of your property. Stains like these, if left untreated, can badly affect your building and ultimately damage the surface. The DOFF Steam cleaning system is recognised as the premiere system for cleaning a wide range of surfaces to remove everything from stains, moss and lichen to graffiti, paint and pollution damage. The systems utilises high-temperature steam from water temperatures up to 150°C and an adjustable nozzle. More importantly cleaning is delicate on the building surfaces ensuring stains are removed without damage. A poorly maintained and unsightly exterior to your building can leave a negative impression on staff, visitors and customers alike. We will bring it back to life and put in place a carefully structured and cost effective maintenance plan to preserve the exterior surfaces to your place of work. This will in turn extend the life of your building and can only have a positive effect on current and future value. 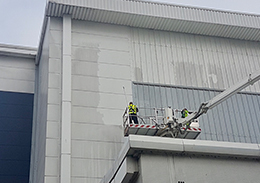 Our Cleaning Technicians are fully trained and experienced in all Façade and Cladding Cleaning services that we provide to our clients. s.
We work within all industry standard Health and Safety guidelines and requirements. We will provide all relevant Risk Assessments and Method Statements prior to any work taking place.